The market taxonomy of the global general well-being dietary supplements market is presented to give a holistic picture about this market and ensure that all the segments and sub-segments of this market are properly represented. This market taxonomy also helps the report readers in getting the full extent of the global general well-being dietary supplements market and helps in the logical interpretation of the market numbers presented in this report. As per the current trends, consumers are becoming more health conscious and are focusing on preventive healthcare that keeps them in a good shape. In addition, due to the growing prevalence of chronic diseases such as diabetes, high blood pressure and obesity, consumers across the world are becoming wary and want to avoid such health complications by staying healthy. In order to stay fit and healthy, consumers are resorting to consuming various dietary supplements that help them maintain good health. Also, consumers are frequenting various gyms, diet centers and fitness centers that promote the consumption of such dietary supplements. Dietary supplements are becoming increasingly popular in the global market. To cash in on this trend, various companies have introduced a variety of dietary supplements in the market and consumers have a wide choice in choosing the type of supplements they wish to consume. Also, with rising disposable income and a growing awareness about health, consumers are spending on such dietary supplements in order to keep themselves fit and healthy. To explore the market of dietary supplements in greater detail, Persistence Market Research has come up with a detailed and informative report that covers all the aspects related to the global general well-being dietary supplements market. These aspects are covered across all the major regional markets spread all over the world. This report also presents the historical analysis of the global general well-being dietary supplements market for the time period 2012 to 2016. In addition, the projections of this report are for the time period starting from the year 2017 and lasting till the year 2026. As per these market projections, the global general well-being dietary supplements market is projected to display a robust CAGR. 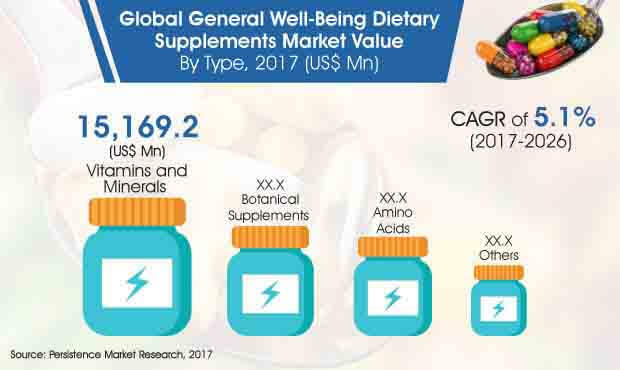 According to the data presented by Persistence Market Research, the global general well-being dietary supplements market was estimated to be valued at nearly US$ 36,250 Mn in the year 2017 and is anticipated to reach a value of nearly US$ 56,900 Mn by the end of the year 2026. The vitamins and minerals sub-segment in the type category of the global general well-being dietary supplements market is expected to display a moderate CAGR of 4.5% during the forecast period. This is the most lucrative sub-segment in the type category. As per the assessment of Persistence Market Research, the vitamins and minerals sub-segment was estimated to be valued at just under US$ 15,170 Mn at the end of the year 2017 and is expected to reach a value of nearly US$ 22,550 Mn by the end of the assessment period in the year 2026. The botanical supplements sub-segment is the second largest segment by value in the type category, and is expected to display a CAGR of 5.7% during the period of forecast. The botanical supplements sub-segment was estimated to be valued at nearly US$ 9,950 Mn in the year 2017 and is poised to reach a value of nearly US$ 16,350 Mn by the end of the period of forecast in the year 2026. The report on the global general well-being dietary supplements market displays information about the important companies functioning in this market such as Koninklijke DSM N.V., Glanbia PLC, Bayer AG, Kerry Group PLC, DuPont de Nemours and Company, Alticor Inc., USANA Health Sciences, Inc., Nutramax Laboratories, Inc., Herbalife International and NOW Health Group, Inc.